Budgerigars were trained by operant conditioning to produce contact calls immediately after hearing a stimulus contact call. In Experiments 1 and 2, playback stimuli were chosen from two different contact call classes from the bird’s repertoire. Once this task was learned, the birds were then tested with other probe stimulus calls from its repertoire, which differed from the original calls drawn from the two classes. Birds failed to mimic the probe stimuli but instead produced one of the two call classes as in the training sessions, showing that birds learned that each stimulus call served as a discriminative stimulus but not as a vocal template for imitation. In Experiment 3, birds were then trained with stimulus calls falling along a 24-step acoustic gradient which varied between the two sounds representing the two contact call categories. 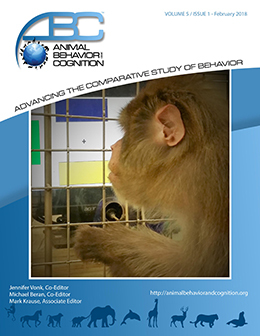 As before, birds obtained a reward when the bird’s vocalization matched that of the stimulus above a criterion level. Since the first step and the last step in the gradient were the birds’ original contact calls,　these two patterns were easily matched. Intermediate contact calls in the gradient were much harder for the birds to match. After extensive training, one bird learned to produce contact calls that had only a modest similarity to the intermediate contact calls along the gradient. In spite of remarkable vocal plasticity under natural conditions, operant conditioning methods with budgerigars, even after extensive training and rigorous control of vocal discriminative stimuli, failed to show vocal learning.